Barrett Agri, both supplies the full range of beet inputs and provides a full crop walking agronomy service which is vital to growing a successful crop of beet. In dealing with both the tillage sector and dairy sector we have an advantage that we can source quality beet and supply this to the dairy / livestock sector. Beet is a high yielding fodder crop grown widely in the Munster area. Beet offers high fresh weight yields grown on good free draining soils. Planting starts from mid March onwards with the aim to have row closure by the longest day of the year to maximize sunlight interception. To get to this point it is vital to have the correct weed control / nutrient programme. Barrett Agri team of experts can help you to achieve this. 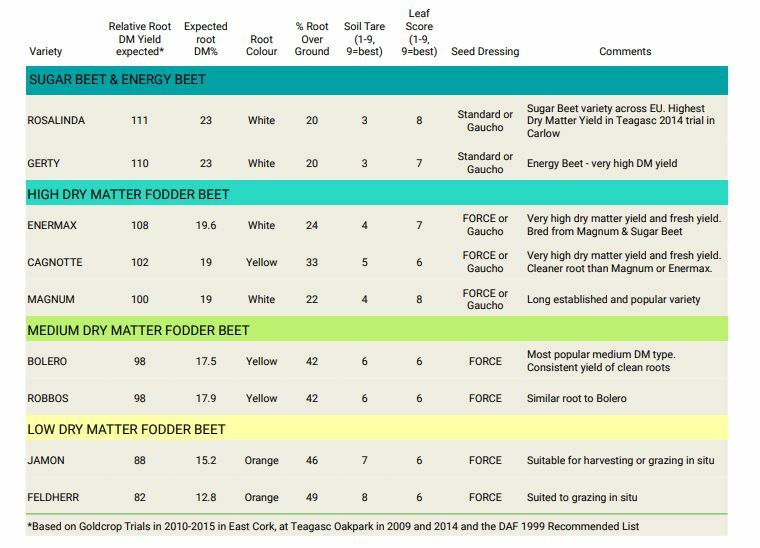 Depending on end use, both beets are an excellent forage crops, with fodder beet been slightly higher fresh weight yield but sugar beet been the higher quality, see table below. As beet is a low protein forage, it is important to always balance diets. On an annual basic Barrett Agri pick the top varieties from breeders / suppliers to match the growers needs whether it be high dry matter sugar beet or big yielding fodders beets. We have the variety for you. Clean yellow root and medium dry matter content, it is an ideal choice for both dairy and beef production. Superb Autumn grazing conditions on this mornings allocation, of fodder beet (Variety Robbos) in Drimoleague West Cork. Fodder beet is a great feed for cows in late lactation as it increases production and solids as well as BCS gain. Video courtesy of Area Rep Roland Whelton. October to March Varieties with higher % roots in the ground also have higher dirt tares. The higher the dry matter, the deeper the beet sits in the ground and the more frost resistant. The tops of the Magnum Fodder Beet can be utilised if required to boost the total fodder output ever further. The roots tend to be lifted and stored how ever some farmers have strip grazed certain varieties with dairy cows successfully. High dry matter yield and good % out of the ground with the added insurance of Rhizomania resistance. Enermax has white root colour and is a variety based on the well-known fodder beet Magnum. The yield of dry matter in the root of Enermax is around 10 % higher compared to Magnum, but yield of top is slightly lower. Enermax is resistant against the disease Rhizomania. Enermax has a very smooth root. The consequence is a very low dirt tare and the soil on the root when lifted falls off easily. Enermax is placed relatively high in the ground. Rosalinda is a very high yielding variety. It also has the best disease combination of any variety – seven for rust and nine for powdery mildew . It has moderate bolting resistance, for early sown crops. Beet is a high energy, low protein and low fibre feed. Treat it as a forage concentrate as it digests very quickly in the rumen. Roughly 4kg Sugar Beet = 1kg Barley and 5.5kg Fodder Beet = 1kg Barley. It is important to introduce beet gradually, allow a two week introduction period. The total diet must be balanced for protein, fibre and minerals particularly Calcium, Phosphorus and Copper. Roots must be clean and washing is preferable. Beet should be chopped as this greatly increases intakes, this is most important for younger cattle and for sheep. Beet is a highly palatable and highly digestible feed and in a properly balanced diet it should result in excellent animal performance and more efficient milk and meat production. Low Dry Matter Fodder Beet can be grazed in situ where soil and weather conditions permit. For more agronomy information and seed selection please contact our Team of experts.